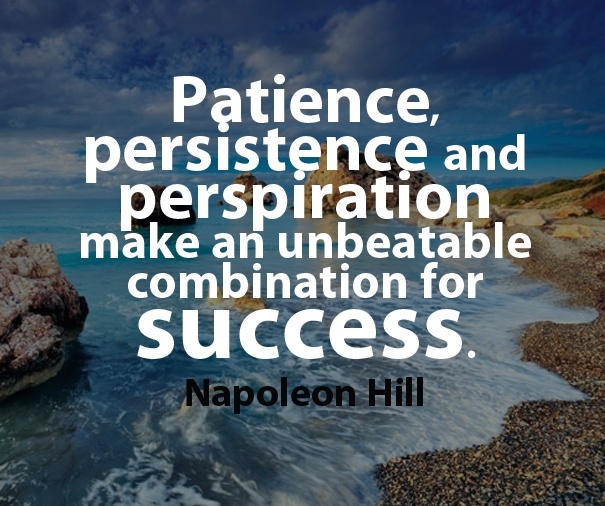 In the quote by Napoleon Hill, “Patience, persistence and perspiration make an unbeatable combination for success,” we find the recipe for job search success. The combination of all three is what separates the successful job searchers from the unsuccessful. You can’t have one without the other two. It’s a complete package. Patience. Patience is a virtue is something we all know. But it isn’t something we all have especially in our instant gratification world we live in. Imagine leaving the house without your cell phone. The panic it causes. But what did we do 10 years ago when we didn’t have a cell phone? We waited until we got home to find out who wanted to talk to us. Patience is needed in the job search. Nothing happens overnight. You might hear some stories about people getting a job quickly, but those are few and far between. Currently, the hiring process from submitting a résumé to getting an over can take several months. You don’t want to give up, instead your must persist. Persistence. Fits and starts don’t work. It’s a lesson we learned from the children’s story, “The Tortoise and The Hare.” Steady progress is the way to success. The secret formula to success. Job searching is very difficult. It’s also painful. But to be successful you must keep at it even when you think nothing is happening. You must continue submitting resumes for positions you are qualified for. You must follow up when you feel like giving up. Very few people have hiring managers banging down their doors with job offers. You are the one who must go after them and keep going after them. It’s your perspiration that will get you a job. Perspiration. Nothing happens unless you work. Very few people get anywhere without doing any work. They were either born wealthy or very lucky. If you aren’t one of the select few, you need to do the actual work. No one can so the networking for you. Creating a résumé that says you are the one takes time and energy. When you are interviewing, there isn’t anyone else there to do the talking. You must do the research and know your value proposition. It takes time and effort to get it done and you have to do it. Success. Success comes when you have worked hard; didn’t give up no matter how frustrated you were, and waited out the long hours, days, weeks and months of struggle. Now comes the reward. The fruits of your labor. Your job search will be over. You will get a job. And you will have earned it. Your efforts will pay off. Keep going even though you aren’t seeing results. It will come. Be positive that it will and start thinking like a success, and you will be. 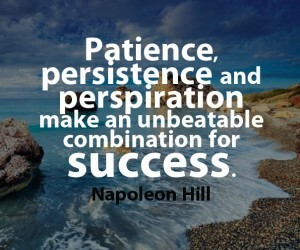 Napoleon Hill ought to know. He spent his life researching, teaching and writing. He worked hard and it paid off. 5 Comments to "The secret formula to success"
Besides patience, persistence and perspiration,a relevant resume and focussed networking will help in successful job hunting. Basant, you are correct. Thank your sharing that!